Sheriff Jay Russell and the Deputies of the Ouachita Parish Sheriff’s Office recognize the importance of not only a safe Ouachita Parish for its residents, but one that is environmentally clean as well. 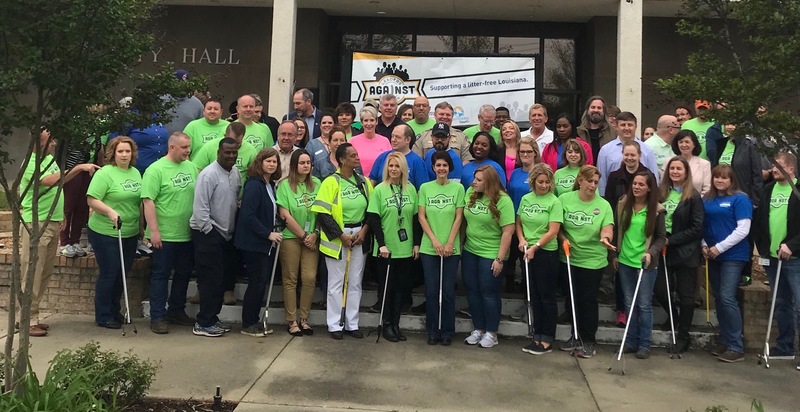 On April 12th, the Leaders Against Litter Event was held in West Monroe. This event recognizes the combined efforts of elected officials, business leaders and public servants working to keep Ouachita Parish clean. As part of his commitment, in conjunction with the Ouachita Parish Police Jury and Ouachita Green, Sheriff Russell has three deputies assigned to code enforcement. Under the supervision of OPSO Sgt. Wayne Heckford, it is their responsibility to issue citations, supervise litter collection activities, and work to maintain the overall beauty of public places in Ouachita Parish. For 2018, Code Enforcement issued a total of 334 citations for littering and illegal dumping. A total of 194.46 tons was collected from our roadways as well. The tons collected were down 48.14 tons from the amount collected in 2017. These numbers prove that the programs in place by OPSO, the OPPJ and Ouachita Green are working. Not only is enforcement effective, but improved public awareness and cooperation by not dumping is a factor in producing positive results. OPSO and OPPJ work crews also assisted in distributing and planting trees in public places in Ouachita Parish such as Cheniere Lake Areas 1 & 3, the Richwood City Park and roadside areas in Sterlington. We believe with our continued efforts and the support of local residents, we will continue to improve the natural beauty of Ouachita Parish.